What can I do to help my child’s allergies? Pollen counts are high and allergies are bad. Phone calls and office visits regarding allergy have risen sharply in the last week or so. There are many steps you can take to help your child with allergies this time of year. We hope these suggestions will help, but if they don’t, please make an appointment with your pediatrician to learn about further treatment options. The best way to decrease allergy symptoms is to avoid the things to which you are allergic. Wash hands when coming indoors – at school and at home. Change clothes upon entering the house and do not keep the laundry hamper in the child’s room. Shower nightly and as soon as possible when finished playing outside. Keep plenty of tissues around and teach your child not to use a tissue to rub his eyes, especially outdoors, because this brings the pollen right to his eyes. A cool compress will also help reduce swelling and itchiness. What over-the-counter (OTC) medicines can I use? Allergies are caused by the body’s release of histamines. Anti-histamines are a mainstay of allergy treatment. They treat the general symptoms of runny nose and itchiness. Benadryl is the most widely known anti-histamine, however, it is not the best choice for allergy sufferers, because its effects only last a few hours, and it often causes sleepiness. It can be useful at bedtime when symptoms are interfering with sleep. Claritin (Loratadine is the generic name) is the most commonly used OTC allergy medication. It is dosed once a day, usually in the morning. The dose for ages 6 and up is 10mg – given either as a pill or a dissolvable tablet. A liquid form is available. It comes as 5mg per teaspoon. Children over 6yrs get 2 tsp. Children 4-6yrs get 1 tsp. Children 2-4yrs. get ½ tsp. Zyrtec, generically known as cetrizine, is another commonly used allergy medicine available over-the-counter. Often providing more effective relief than Claritin, Zyrtec is also slightly more likely to cause sleepiness, so most physicians recommend using this once daily medication at night. The dose for ages 6 and up is 10mg – given either as a pill or a chewable tablet. A 5 mg chewable is available for children 4-6 years old. A liquid form is available as well. It comes as 5mg per teaspoon. Children over 6yrs get 2 tsp. Children 4-6yrs get 1 tsp. Chlidren 2-4 yrs get ½ tsp. Zyrtec brand liquid was taken off the market last year (along with Tylenol) and has not come back yet. Store brands of Cetrizine will work as well. Allegra (fenofexadine) just became available over-the-counter in March 2011. If you have noticed that claritin or zyrtec are not working as well for your child, you should try Allegra. Dosing for those 12 years and older is 60 mg twice a day or 180 mg once a day. Dosing for children 6-12 years is 30 mg twice a day. For children under 6 years, check with your pediatrician. Allegra comes as liquid -30 mg per teaspoon and as 30 mg ODTs (orally disintegrating tablets.) It also comes as 60 mg and 180 mg tablets. Decongestants, like Sudafed, can be added to antihistamines when congestion is the major problem, but this is not typically needed for Spring-time allergies. If OTC antihistamines are not working make an appointment to discuss a prescription strength anti-histamine. Yes, if eye itchiness is a major symptom, then allergy eye drops will help. Zaditor is a medicated eye drop that is now available over-the-counter. It can be used in children as young as 3 yrs. It can be used on an as needed basis but will be more effective if used every day. If your child’s eye allergies are very bad this year, next year we would recommend starting eye drops in April, just before the season hits. What can I do if over-the-counter medicines don’t work? There are lots of prescription medicines for allergies. There are antihistamines such as Clarinex and Xyzal. Also, there are anti-inflammatories such as Singulair and there are eye drops such as Pataday, Elestat and Optivair. Lastly, pediatricians often recommend nose sprays such as Nasonex, Flonase, Veramyst and Rhinocort. 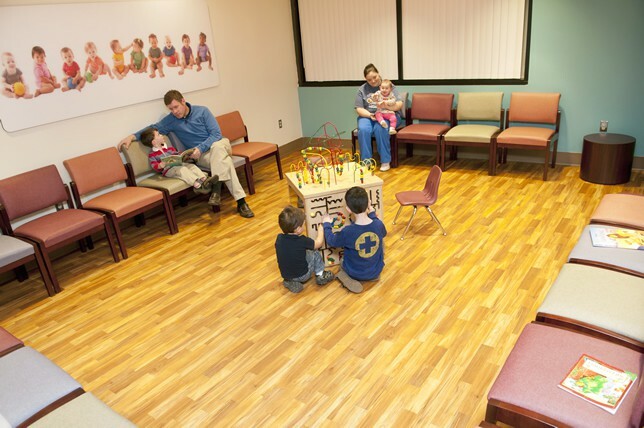 As always, we recommend to make an appointment with the pediatrician to help you map out a plan for your child. My child is on prescription medicines but is still having symptoms. Often, when one medicine doesn’t work, another medicine in the same class will be more helpful. Or, it is possible to combine several different medicines. Make an appointment to see us and discuss the situation. How can I tell an allergy from a cold? Allergies often cause itchy eyes and noses, along with the clear runny nose. Allergies cause sneezing “fits” as opposed to the occasional “achoo” of a cold. Allergies can linger for weeks to months; colds are usually done within 2 weeks. Allergists can be helpful when your child has not found relief from OTC meds or the prescriptions we have given you. Allergists can be helpful in many ways – identifying the cause of allergies, helping to adjust or minimize medications in chronic sufferers, and as a last resort, the formulation and treatment with allergy shots (immunotherapy). The mother of my 6-year old patient explained to me that her daughter always gets high fevers, especially when she is sick. Mom says she keeps on bringing her child in to see the pediatrician, but the doctor never seems to be concerned about it. Aren’t fevers dangerous? The short answer is that high fevers, in and of themselves, are not dangerous in normal children. The only fevers that are dangerous are those that occur with heavy exercise in hot conditions where the body’s fever control thermostat breaks down. Fever is a symptom, not a disease. It is not the height of the fever that is of concern, but the nature of the illness causing the fever. In the case of viral illnesses of childhood, the body will not allow a fever to get high enough to cause damage. Unfortunately, there is a “fever phobia” in America. Surveys of parents over the past 20 years have shown little change in it. In fact, the American Academy of Pediatrics recently issued an updated clinical report titled “Fever and Antipyretic Use in Children” The Academy says it has issued the report to help pediatricians and primary care physicians (general practitioners) educate parents and families about fever and fever phobia. Like most normal bodily responses, it has a purpose. Mild to moderate fevers actually promote the body’s defense against illness. Temperatures less that 100.5 F are not fever at all, they are NORMAL. Fever’s up to 102 F rarely makes kids sick and is often beneficial. Most Pediatricians do not consider a fever “high” until it is 104 F. or greater. Even then, the disease causing the fever may not be serious at all. A lot depends on the age and clinical appearance of the child and other symptoms that might be present. You must assess how the child appears; how he or she is acting; do they make eye contact? Are they drinking? Are they consolable? Therefore, if your child has a fever, it is always good to call your Pediatrician for advice. It is not good to be frightened or panic and run to an emergency room, since the vast majority of fevers are caused by common viral illness. The only exception to this advice is in the very young infant. If your child with fever is less than 3 months of age or appears very ill, however, then an immediate call is mandatory.